The Tektronix Type 531 is a 10 MHz oscilloscope that accepts letter-series and 1-series plug-ins. It is exactly like Type 535 except it does not have the Delayed Sweep (dual timebase) feature. The 531 and 535 were the first Tektronix scopes to accept plug-ins. It was introduced in March 1954 simultaneously with the Type 535, and superseded in 1959 by the Type 531A, which has more convenient controls and a slightly faster (15 MHz) vertical amplifier. 531s with below S/N 7950 have DuMont 5BGP2 instead of Tektronix T533P2. In serial numbers 101 to 7600, the 531's L-C delay line is before the vertical amplifier. In serial numbers 7601 and up, the 531's delay line is between the vertical amplifier and the CRT. 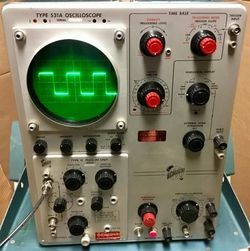 This change was the result of John Kobbe's insight that if the far end of the delay line was an open circuit (which the CRT approximates), the reflected wave could be absorbed at the source end. This "single termination" approach made it possible to do away with the output chassis. All Tek scopes using a lumped-constant delay line went to this topology. There is also a rack-mount version, Types RM31 and RM31A. They have a sliding chassis so that the scope can be serviced without removing it from a rack. The 532 is similar to the 531, but designed to be more reliable at the expense of slower risetime. The 541 is mostly the same as the 531, but has a distributed vertical amplifier for 30 MHz bandwidth, and a different CRT. This page was last edited on 23 November 2018, at 07:49.